This is the perfect game for your outdoor activities. Tell family and friends that you'll bring the lawn darts to your next family gathering! Lawn darts is a fun new yard game played with weighted darts! The game is a modern and safer twist to horseshoes, ring toss, or bocce ball. Fun and exciting for two to four players. Great family game and fun for players of all ages. Get Started! Players place the target on a soft surface. Players take turns tossing their darts at the target. You may use the 2 plastic rings as bonus targets, or use them as “sand pits” to loses points. The first player to have 21 points wins. Sounds easy enough, but these darts bounce and roll, so hitting the target will test your tossing skills! How do you toss your darts? Imagine lawn darts meets miniature golf. Players take turns placing the target and then tossing their darts at the target. Wherever the player's dart lands is where they start from next. You may use the 2 plastic rings as “water” where the player adds a point or stroke to there score. At the end of nine rounds, the player with the lowest score wins! Satisfaction guaranteed! If you are not satisfied with our game, return it for a full refund. Order today and take it on your next excursion. You won't regret it, we promise. ✔ YOUR PERFECT FAMILY GAME - Your lawn darts are perfect for any special event! Imagine how much fun you will have at the beach, park, or in your yard. Make your own rules and never run out of fun ways to play! ✔ THE DESIGN - Your lawn darts are made of strong brightly colored composite plastics and designed to last! The reinforced plastic allows you to play for hours. 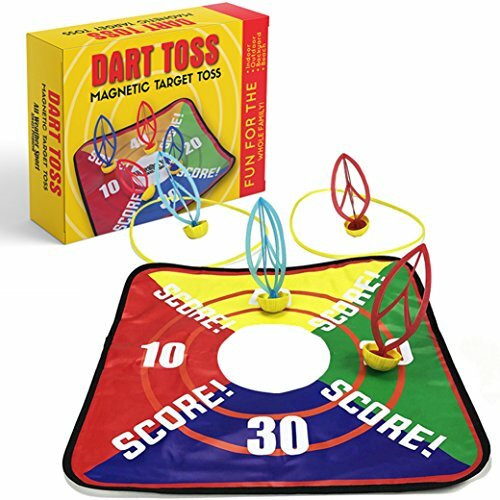 Your new set of lawn darts includes 1 magnetic target mat (18.9" X 19.9"), 4 weighted darts (77 grams), and 2 plastic rings. Your darts are designed with rounded edges for safety. ✔ THE IDEAL FIT - Your new game will build hand-eye coordination for young ones and get the whole family outside. Lawn darts allows you to play with 2 to 4 players. ✔ FUN - These new soft, durable lawn darts are fun at any gatherings. The game is designed for use on soft or yielding surfaces. ✔ SATISFACTION GUARANTEED - Love the game or we will buy it back, no questions asked! If you have any questions about this product by All Weather Sport, contact us by completing and submitting the form below. If you are looking for a specif part number, please include it with your message.